The internet is absolutely vast – but for a local company, this isn’t always a good thing. Someone searching for a cake bakery in New York doesn’t want to find a website for a bakery based in Birmingham. An SEO agency’s job isn’t just to get websites ranking on keywords, they have to be the right keywords. For local businesses, this means paying attention to location at all times. Fortunately, if you’re smart and understand the many options that search engines like Google present, this can be very, very achievable. If you have a walk-in business, people will want to know exactly where you’re based. Google maps is great for this. If you can get your business established, you’ll appear on some very specific organic listings: the 3-pack. The local 3-pack is a list of 3 businesses in the area (and Google is getting pretty good at knowing where users are, especially on mobile devices). It goes without saying that this is prime material and the competition can be strong, depending on your niche. In this case study, Nozak Consulting helps get a local company into the 3-pack for their industry: car tyres. How? By looking at the existing 3 leaders and devising an SEO strategy to beat them. This meant better content, developing backlinks and optimising the website to give it better domain authority. A key part of this also involved improving directory listings and deleting those that where not relevant. Consistent information is vital. If Google sees one, clear address, it’s more confident showing this to users within your proximity. 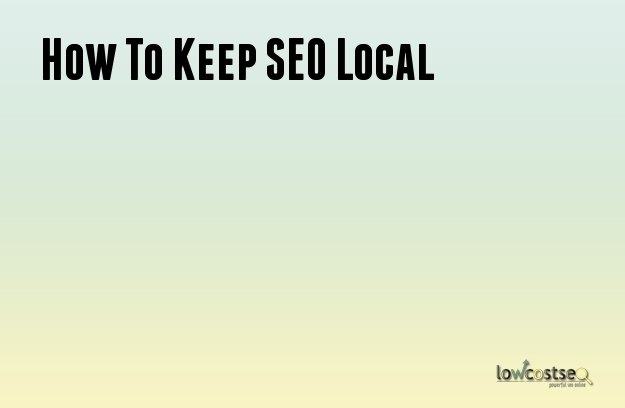 Instead, you should focus on long-tail keywords that contain the local area. Any combination of [product/service] + [location] will often be a good start. These get lower search volumes, but they have less competition and represent traffic that is ready to actually engage with you. They know what they want and now they want to know how close it is. However, Google is much smarter than this. It can also use Schema data and business listings (especially its own Google My Business) to help users. In this example, Digital Shift Media use all of these facts – keywords, schema data and business listings – to get their client on the top of 3-pack results. Needless to say, “handyman” is a very relevant term and hotly contested. Getting this under a local search is a big win, and shows that keeping your SEO focused makes a big difference. Marketing Sherpa tried a very similar approach, which resulted in 333% more revenue for their client. Needless to say, the system works. When you search for certain things – particularly branded or specific terms – Google likes to show a box full of information on the right hand side of the SERP. This is called a knowledge panel and it works for local businesses, too. Of course, this involves using your business name, but it can be surprising how many people search for your business name itself – especially if your other forms of marketing are effective enough. It’s not always easy, however. In this case study, Go Fish Digital had a client with two local premises, neither of which where creating a knowledge panel. This was partially because the location with less reviews and focus was often coming up first. The client wanted this shifted. Go Fish Digital achieved this through correctly editing business listings (giving the secondary location a different, non-duplicate name) and adding all of the previous elements: schema, website copy, local listings et al. Such a big presence on the SERP is impressive and will go a great way to directing lots of traffic. Finally, there is always the likes of PPC. It goes without saying that this should also follow the same keyword principals. If you target broad keywords, your cost-per-click will skyrocket, will no guarantee of acceptable conversion rates. Local keywords – as well as setting your campaign to only target local people or people specifically searching in regards to the area – will also help control this. While you will likely still compete with other businesses, the overall costs will be kept down.